Be vigilant, stay informed! : Unique Informative Articles, Strategic Trends, and Current News from a Biblical perspective. Iran’s Supreme Leader Ayatollah Ali Khamenei told military commanders on Sunday the United States had created the “myth” of nuclear weapons to portray Iran as a threat, hardening his rhetoric before nuclear negotiations resume this week. The commander of the US army in Europe, Lt-Gen Frederick “Ben” Hodges, says that Nato must remain united “as insurance” against Russia. Requiring Iran to recognize Israel as part of a comprehensive nuclear agreement would be a “fundamental misjudgment,” President Obama said on Monday, adding that the U.S. cannot depend on the nature of the regime in Tehran changing. These are a few of many from our News Alerts Twitter feed at @kiresearch. Also, visit our Facebook Page and our Facebook Group. In his vision in the Book of Revelation, the Apostle John sees the “beast,” also called the Antichrist, rising out of the sea having seven heads and ten horns (Revelation 13:1). Combining this vision with Daniel’s similar one (Daniel 7:16–24), we can conclude that some sort of world system will be inaugurated by the beast, the most powerful “horn,” who will defeat the other nine and will begin to wage war against Christians. John goes on to describe the ruler of this vast empire as having power and great authority, given to him by Satan himself (Revelation 13:2), being followed by and receiving worship from “all the world” (13:3–4), and having authority over “every tribe, people, language and nation” (13:7). From this description, it is logical to assume that this person is the leader of a one-world government which is recognized as sovereign over all other governments. Twentieth Century history and current events doesn’t make it hard to imagine how such diverse systems of government as are in power today would willingly subjugate themselves to a single ruler. The disasters and plagues described in Revelation as the seal and trumpet judgments (chapters 6–11) will be so devastating and create such a monumental global crisis that people will embrace anything and anyone who promises to give them relief. Once entrenched in power, the beast (Antichrist) and the power behind him (Satan) will move to establish absolute control over all peoples of the earth to accomplish their true end, the worship Satan has been seeking ever since being thrown out of heaven (Isaiah 14:12–14). One way they will accomplish this is by controlling all commerce, and this is where the idea of a one-world currency comes in. Revelation 13:16–17 describes some sort of satanic mark which will be required in order to buy and sell. This means anyone who refuses the mark will be unable to buy food, clothing or other necessities of life. No doubt the vast majority of people in the world will succumb to the mark simply to survive. Again, verse 16 makes it clear that this will be a universal system of control where everyone, rich and poor, great and small, will bear the mark on their hand or forehead. There is a great deal of speculation as to how exactly this mark will be affixed, but the technologies that are available right now could accomplish it very easily. There also seems to have been moves afoot recently to implement a one-world currency. In April of 2010 a paper was released by the Strategy, Policy and Review Department of the IMF (International Monetary Fund) titled “Reserve Accumulation and International Monetary Stability”. In the introduction of the document, the task force advocated the establishment of the Bancor as a one world currency, a sui generis, that the entire world would use. It also recommended the establishment of a single global central bank to administer the currency. A limitation of the SDR as discussed previously is that it is not a currency. Both the SDR and SDR-denominated instruments need to be converted eventually to a national currency for most payments or interventions in foreign exchange markets, which adds to cumbersome use in transactions. And though an SDR-based system would move away from a dominant national currency, the SDR’s value remains heavily linked to the conditions and performance of the major component countries. The IMF suggests that the world’s nations “develop, over time, a global currency. Called, for example, Bancor in honor of Keynes, such a currency could be used as a medium of exchange—an “outside money” (outside the world monetary system) in contrast to the SDR which remains an “inside money”. As the report implies, the idea of a Bancor as a world currency is not a new idea. In August 1942, in his work, “Proposals for an International Clearing Union”, Lord John Maynard Keynes outlined a plan where the countries of the world would convert their gold reserves to Bancors as a modicum of trade. In an interesting section of the paper, countries could convert gold into Bancors, but could not convert Bancors back to gold. In the Keynes paper, countries could leave the consortium of countries using the Bancor, but they leave their gold behind. It is a one-way ticket. As like most governmental proposals, they never die, they just come back again under a different form (Common Core is a recent example). There is no country which can, in future, safely allow the flight of funds for political reasons or to evade domestic taxation or in anticipation of the owner turning refugee. That is the endgame — capital controls. With a one world currency, people would no longer be able to leave countries for other places that had lower taxes, as has recently happened with France. While France had to rescind its 75% wealth tax after wealthy individuals left for greener pastures, such as England and Belgium, if there was a one world currency, travel restrictions .could be placed on these individuals to keep them where they are. Actually, it is not the people these countries would be interested in, it would be their money. While a global currency may not be in the offing, there may be a more immediate way to control currency flight and speculation, do away with currency altogether. Willem Buiter, an economist for Citigroup, a global bank, suggests the reason for the world’s economic troubles is the existence of cash. Banks now are paying negative interest rates (meaning you pay the bank to keep your money and its value is also reduced through inflation). A saver is better off keeping their money stuffed in a mattress than keeping it in a bank. Cash, therefore, is an effective way of avoiding this negative savings rate. To Buiter, this is a bad thing. Keeping cash instead of putting it in the banking system deprives the banks (and the government) the use of this money. In the Keynesian monetary theory, less money in the system would raise interest rates and thus reduce the demand for the money in way of loans. This is anathema to Keynesian economists. The thing to do is to abolish cash. Abolishing cash would end the last remnants of financial privacy. It would also increase a government’s ability to manipulate the economy with negative interest rates. Buiter correctly assumes that there would be resistance to this proposal, but he believes that “the arguments against abolishing currency seem rather weak.” As stated before, these ideas may not take root immediately, but they will come back in another form. Events in geopolitics and financial markets are making things clear that we are living in a time that is spoken of in the Bible more than any other time, including the time that Jesus walked the shores of Galilee or climbed the mountains of Judea. The “ten-horned beast” is a prophetic image that occurs in Daniel (Dan. 7:7–8, 20, 24) and Revelation (Rev. 12:3; 13:1; 17:3–16). There are some prophecy writers that believe that the ten-horned beast is a symbol for a European organization, such as the European Union. Recent events, however, would tend to disprove the idea of the European Union will be the ten-horned beast written about in the Bible. The intent of the European Union (EU) was to bond European nations so closely together in such a prosperous enterprise that no nation would have any reason to break the peace or fear another. After Europe struggled for centuries to establish their individual national sovereignty and self-determination, they were not about to sacrifice that sovereignty again. They wanted a system where the sovereignty of all the countries was to be retained, but constrained in such a way that no one could take it away. The EU was founded for “peace and prosperity.” The thinking was that wars would not break out between countries involved in trade. If either the peace or prosperity disappeared, or disappeared in some nations, what would happen to the organization? Current events had shown what would happen and the answer is not pretty. From its founding until 2008, the EU flourished. Then in six weeks it all unraveled. The self-confident certainties of Europe began to come apart. Peace and prosperity both were broken and Europe suffered a crisis. The first event that shook the EU was the Russian invasion of Georgia in August of 2012. The invasion did two things. First, is shattered the illusion that war between nations in Europe was impossible. Second, it also ended the period of Russia’s irrelevance. From the fall of the Soviet Union until the invasion, Russia was written off as a potential threat. With the collapse of the Soviet empire, new nations were spawned and old nations were freed. When the Soviet Union fractured, the newly formed ex-Eastern Europe wanted to join NATO and the EU because they believed that this would guarantee their security, prosperity. Russia thought it had reached an agreement with the West that the newly liberated nations would not be incorporated into either organization. Russia wanted to assure a buffer zone from what it considered Western Expansionism. The Georgian action put the West on notice that Russia was a country not to be trifled with. It also let the other countries of the Eastern bloc that the same could happen to them if they got too close to the West. Russia’s recent actions in Crimea and Ukraine are just a continuation of this policy. The European Union does not have a defensive component; it assumes that NATO would fill that role. The thinking was that Germany would bear the brunt of a Russian attack and France would fight a holding action at the back door until the United States could gear up and enter the fray. Russia’s limited actions in Eastern Europe were not in the game plan and NATO’s response was … nothing. There were protests and sanctions that are hurting the Russian economy, but the Russians or their proxies are still in place. That destroyed the notion of peace for the EU. Now the notion of prosperity has now been shattered as well with the multiple debt crises that have arisen. The PIGS countries (Portugal, Italy, Greece, & Spain) have been a source of trouble for the EU. Greece is the most immediate problem for the EU now. European Union members want Greece to do more to revamp its debt-burdened economy before they release another round of loans in the 240-billion-euro ($259 billion) bailout program. At stake is Greece’s ability to avoid a default and stay in the 19-nation euro area. 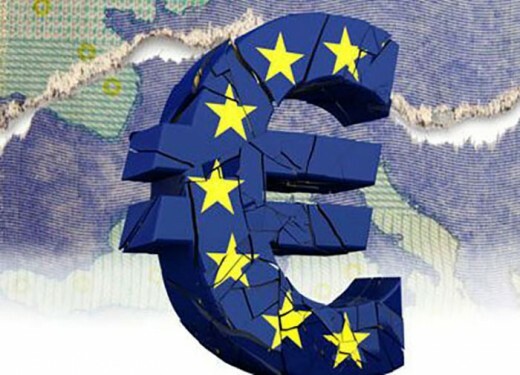 The showdown will figure heavily at a meeting of euro-area finance ministers in Latvia on April 24. In the shadow of the brinkmanship, Greek government bonds last week suffered their worst week since Alexis Tsipras was elected as prime minister in January on a platform promising to undo the tough bailout terms. Greece’s so-called red lines are a refusal to cut wages and pensions, introduce new taxes or sell state assets, Alternate Health and Social Security Minister Dimitris Stratoulis said in an interview with Athens-based Skai TV. While Germany is the focus for pushing austerity on the Greeks, Finland is actually the unlikely stage in Greece’s Eurozone drama. Leaked documents reveal that Finland is already making contingency plans for a Greek exit from the EU. This northern country has turned out to be the most uncompromising of the EU’s creditor nations. Having suffered through three consecutive years of recession, Finland sees its economic output still 5 percent below its pre-crisis levels. Finland has suffered an economic downturn of almost Greek proportions. The boon from oil prices and the launch of Eurozone quantitative easing will still only see the economy expand at a paltry 0.8 percent this year, the worst performance of any EU country with the exception of Italy and Cyprus. Stagnating growth also saw Finland stripped of its much coveted Triple-A sovereign debt rating from Standard & Poor’s last year. While Finland is struggling with its economy almost as much as Greece is, the Finns do not see the Greeks as being serious about getting their spending under control. While most of the world’s attention is looking toward the Iran negotiations, Athens will be keeping half an eye on developments in Helsinki, where with 99% of the votes counted, conservative National Coalition Party had 18.2% of the vote compared to the opposition Centre Party’s 21.2%. The outcome of the elections and the government that Finland forms may very well determine Greece’s economic fate. The anti-NATO Centre party has won the most votes in the election; it still needs to form a coalition. The populist, anti-EU True Finns are predicted to come in second place and it good contention for forming a coalition cabinet with the Center party. Between the two countries, it seems as if either the defensive or the economic nation of Europe will change. To see what the future of the European Europe will be, look to Finland. Two major events in the Twentieth Century added three holidays to the Jewish calendar. These holidays are coming up this month. Those soul-shattering and exalting events were the Holocaust and the establishment of the State of Israel. In 1951, the government of the State of Israel established the 27th of Nisan (April 16 this year) as the date to commemorate the Holocaust and its victims. After much debate, this date was chosen because it occurs between the anniversary of the Warsaw Ghetto Uprising (which began on the first day of Passover, the 15th of Nisan, in 1943 – April 20) and Yom ha-Zikaron (Remembrance Day) and also falls during the traditional mourning period of the counting of the Omer. However, some ultra-Orthodox authorities in Israel opposed the institution of this observance, since it was the action of a secular state and because they did not favor setting aside a special day for the Holocaust. Some congregations and individuals light six yahrzeit candles in memory of the six million Jews who were murdered. Many observances include recitation of the Mourner’s Kaddish and Kel Malei Rachamim (Prayer for the Dead), parts of the traditional service for mourning the dead. In Israel, the day is observed by the closing of theaters and places of entertainment, schools, and most businesses. Wreath-laying ceremonies are held at Yad Vashem, the Jerusalem memorial to the victims of the Holocaust. The Israeli rabbinate has decreed the fast day of the 10th of Tevet (January 1, 2015) as the Day of Kaddish, on which Jews pray and study in honor of the yahrzeit (memorial anniversary) of relatives who were victims of the Holocaust but whose date of death is unknown. In the United States, Holocaust Remembrance Day is usually observed on April 19 (or the nearest appropriate Sunday), the day on which the Warsaw Ghetto uprising broke out according to the civil calendar. Yom ha-Zikaron (Remembrance Day) is a memorial day for those who died fighting for the State of Israel. It is observed on the Fourth of Iyar, the day before Israel Independence Day. Following the Kaddish after Aleinu in the morning service, a memorial candle is lit and Psalm 9 (“A Cry for God’s Justice”) is read. This is followed by Yizkor (May [God] Remember) for the war dead, the Mourner’s Kaddish by relatives of those killed, and the recitation of El Malei Rachamim. These additions to the regular liturgy are concluded with Psalm 144 (“Blessed be the LORD, my rock, who trains my hands for battle and my fingers for warfare,” - ISV). At 11:00 A.M., sirens are sounded throughout Israel, signaling two minutes of silence and the virtual cessation of all activity throughout the country. In addition, a memorial ceremony is held at the Mount Herzl military cemetery, flags are flown at half-mast, and places of entertainment are closed. 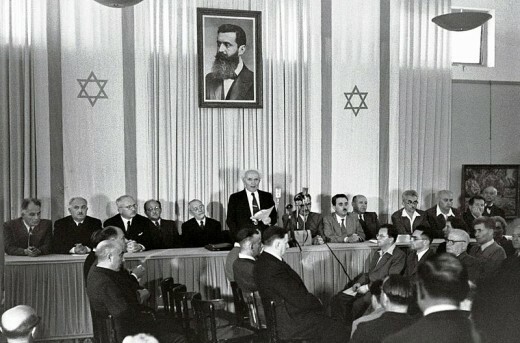 Yom Haatzmaut, Israel’s “Independence Day,” falls on the fifth of Iyyar, the month after Nisan, on the day in 1948 (May 14, 1948) that Israel declared its formal establishment. It is a day commemorated with fireworks, dancing in the streets, and a variety of official ceremonies and public entertainment. Until 1967, the major event was an annual military parade, but this was canceled in response to many complaints that it was stressing human heroism and power rather than the miraculous and spiritual element of the return to Zion. At the conclusion of the day, Israel highest honor, the Israel Prize is granted to individuals who have made special contributions to Israeli culture, intellectual life, and science. Other events include the International Bible Contest for Jewish Youth and the Hebrew Song Festival. In years when the Fifth of Iyar falls on a Saturday or Friday, Yom ha-Atzmaut festivities are held on the previous Thursday to avoid public desecration of the Sabbath. Some congregations in Israel celebrate Yom ha-Atzmaut with an evening service that opens with psalms of thanksgiving (usually Ps. 97, 98, and 107) and ends with the blowing of the shofar and a prayer that soon they will hear the shofar announcing the arrival of Messiah. A festive meal is held with singing, lighting of candles, and even (in some traditions) Kiddush; during the Grace after Meals, Shir ha-Ma’alot is sung to the tune of Hatikvah, the national anthem of Israel. The next morning, psalms added on the Sabbath and festivals are recited. Hallel is said, though there is controversy among the Orthodox as to whether to include the accompanying blessing. This reflects the tension between the desire to praise God for Israel’s independence and the hesitance of either deducing a divine command to do so or making a major festival on a day not authorized by ancient tradition. Some congregations take out the Torah and read three aliyot (blessings) (Deut. 7:12–8:18), followed by the same haftarah (prophet) portion that is read on the last day of Passover in the Diaspora (Jews living outside of Israel) (Isa. 10:32–12:6). In the Diaspora, Yom ha-Atzmaut is celebrated with a variety of parades, cultural events, fairs, and public ceremonies designed to foster solidarity with fellow Jews in the State of Israel. The founding of the State of Israel is in and of itself a miracle. Its continuing existence though the wars it fought since then and will fight in the future is also a sign of divine intervention. It also is living proof that God is a person who is not capricious; He is one who keeps His promises. Just as God has continued to stay faithful to us, we also need to stay faithful to Him. This unique international membership offers education, insight and community for the serious believer. Pray about joining us. If you received this email from a friend, you can get a FREE subscription by signing up at the K-House website.